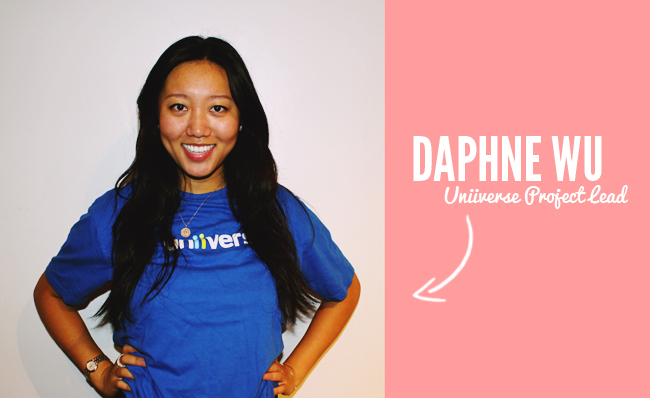 Uniiverse project lead, Daphne Wu, gives us her advice for new interns working with startup companies. "How you'll survive your internship really depends on where you're interning. Since I'm interning with a startup company, everyone is actually "new". The CEO's have never been CEO's before, so they're discovering new things on a day-to-day basis. Everyone on the team is taking things day-by-day and learning so much. It's probably the best first internship experience one can hope for because I'm not running around getting coffee or doing errands for others. I don't have to photocopy paper or watch other people do stuff and just jot notes. I am totally in the field and I get to do what I want as long as I come up with a logistical plan to market and target a niche or community. I have a lot more freedom than others. Thank's so much for your advice, Daphne!